Posh defender Alex Davey has extended his loan at the ABAX Stadium. Photo: Joe Dent/theposh.com. Peterborough United have extended the loan of Chelsea defender Alex Davey to January 2016. The 20-year-old has made a favourable impression at the ABAX Stadium since joining the club at the begiining of August, despite playing games out of position. 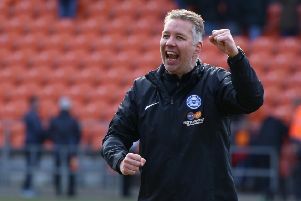 Davey told the Peterborough Telegraph last week that he was keen to stay at Posh for longer than the initial agreement of a month.